This all-steel streamlined car was built in 1949 by American Car & Foundry Co. as C&NW #9302 as a baggage-dormitory car. It was one of three C&NW cars (numbered 9300-9302) in a pool with nine identical Union Pacific cars. All were painted in UP’s gray and yellow scheme. #9302 was renumbered #8903 in 1960 when it was converted to a full baggage car by C&NW. The North Western exited the passenger business in 1971 with the advent af Amtrak (excepting, of course, commuter service in the Chicago area). #8903 was last used by the C&NW as a signal maintainer’s car in Green Bay. The car was donated to Mid-Continent in 1984 for use as a tool and display car to travel with former C&NW steam locomotive #1385 during her tours on the Chicago & North Western system. 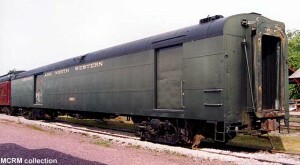 The car was also used on #1385’s excursions on the Wisconsin & Calumet and Wisconsin Central Ltd. 1988-1992. #8903 is currently used for storage at North Freedom.